Brown sugar and apples are probably one of the most classic ingredient combinations. You can use it in tons of desserts, but the flavors also pair together really nicely with proteins such as pork, chicken and turkey. 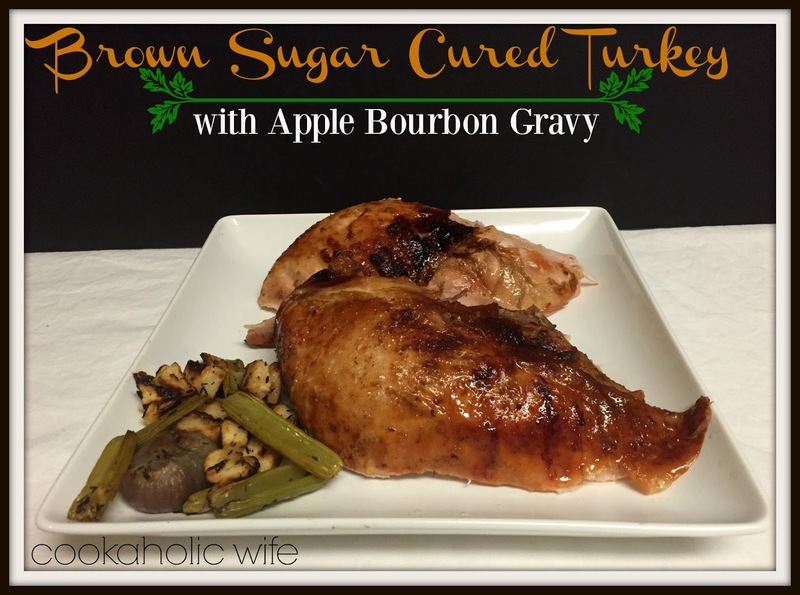 I knew I couldn’t pass up making this delicious combo and putting it on a turkey. Since it’s just Tom and I for all of these mini Thanksgiving-like meals I’m hosting, I opted to make this recipe with just a turkey breast, albeit a large one since there weren’t any small ones in the store. The original recipe calls for a 12 pound turkey, but cuts it up before cooking to ensure that all parts of the turkey are cooked the best way possible. If you’re making a whole turkey, definitely check it out as my adaptions (in cooking only, not ingredients) are just for a turkey breast. 1. Combine brown sugar, salt, fennel, cumin, paprika and crushed red pepper. Rub over the turkey breast. Refrigerate overnight. 3. Place the turkey breast in a roasting pan. 4. In a large bowl, toss together shallots, celery, and apples with olive oil. Arrange in the bottom of the roasting pan. 5. Roast the turkey breast for 30 minutes, then remove from the oven and brush with oil. Rotate the pan and roast an additional 30 minutes. Roast for another 45 to 90 minutes or until the turkey reaches an internal temperature of 155 degrees. 6. Remove from the oven and cover loosely with foil. 7. Pour drippings/fat from turkey into a small saucepan. Add bourbon, chicken stock and flour and cook over medium heat until the liquid reduces to 1 cup. Strain through a fine-mesh strainer. 8. Take half of the shallots, apples and celery mixture and combine with the bourbon-chicken stock mixture in a blender. Process until smooth then reduce to the saucepan. 9. Add butter, parsley, cider vinegar and salt and pepper. Stir until butter has melted. Adjust seasonings to taste. 10. Carve turkey breast, discarding skin and serve with the gravy. I was kind of disappointed with the turkey by itself. I don’t feel like the brown sugar and apple flavors were at all infused into the meat. The gravy, however, is entirely different. 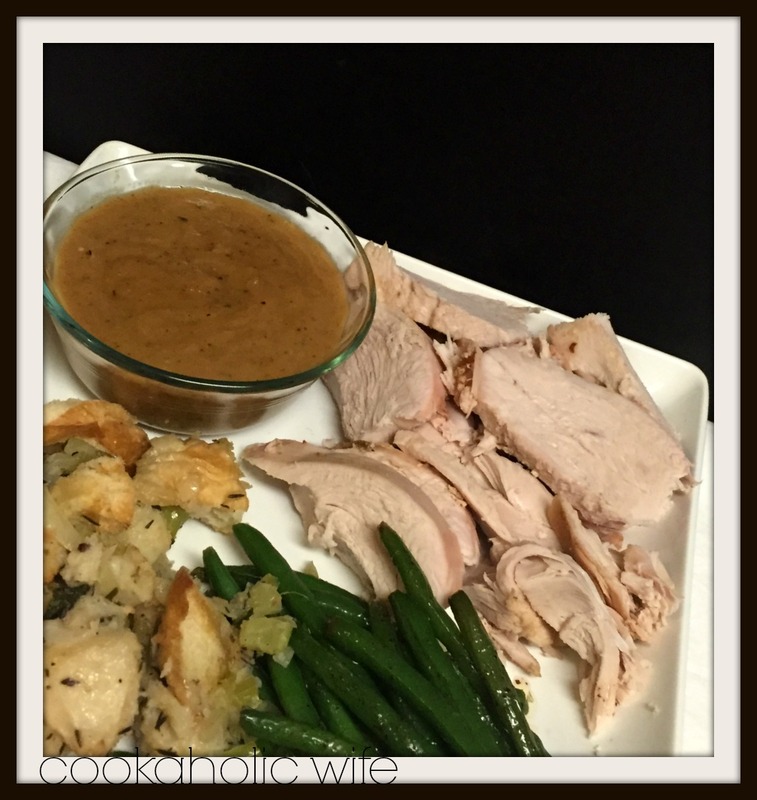 This is one flavorful gravy, which makes sense given the mild flavors of the turkey. You might even want to further thin this out with additional chicken stock (unsalted!) to take away from the intense roasted apple and shallot flavors.